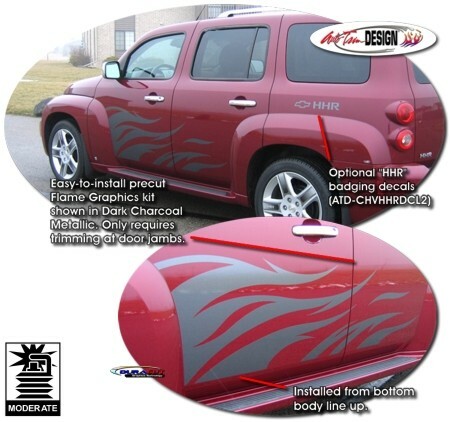 Flame your ‘06-Current Chevrolet HHR with this HOT body side Flame Graphics kit. Easy-to-install two (2) piece kit is PRECUT and ready to install in a wide variety of colors - virtually NO TRIMMING required (light trimming required between door jambs)! Our graphic kit is not just a box of flames. Each piece is prefitted and contour cut as shown in the illustration. This kit is specifically made for the '06-Current Chevrolet HHR and will not fit any other vehicle. Graphic is set for installation from the bottom body line up as shown in image.